University High School provides creative opportunities that help you discover — or rediscover — a love of learning, catch up on your coursework, and graduate from high school. Our innovative classrooms, internships, and experiences promote relevant, hands-on learning that help you prepare for college or whatever next step leads toward your goals. 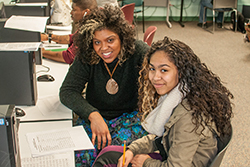 Income eligible Boston students age 16 to 22 and at minimum repeating 10th grade who have fallen behind at least one grade level in traditional high school settings or have left high school without completing their diploma requirements. You’ve faced very real barriers to success in school. Enroll at University High School where We RISE! Through Resilience, Integrity, Scholarship, and Empowerment, you, like all UHS students, can graduate with a high school diploma, an educational plan, knowledge, skills, and the support to achieve your goals as a lifelong learner, in education, your career, and civic participation. Students engage through hybrid learning models. Because we meet you where you are in your learning, you’re able to access the curriculum through challenging and relevant content, experiential education, community service experiences, work-study opportunities, and project-based and capstone assessments. We work in partnership with the Boston Public Schools – Boston Collaborative High School, and we concentrate on core requirements and MCAS test preparation using project-based assignments that ultimately contribute to a portfolio of work that shows what you know. Custom tailored learning plans and scheduling support the achievement of your goals for high school and beyond. We also provide opportunities outside the classroom to encourage lifelong learning. 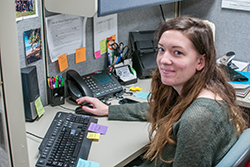 Our professional faculty and staff help you explore higher education options and potential careers, in addition to connecting you to resources that will help you with your educational and occupational interests. 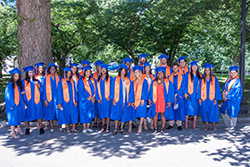 Learn more about ABCD’s University High School.